Regular readers will know that I disapprove of face wipes. I just about concede that they serve a purpose when you're tired/ drunk/ both and are better than nothing but I certainly don't advocate their use on a regular basis. With this in mind, today's review of Good Things Total Wipeout Face Wipes may come as a surprise. Good Things skincare has been developed by beauty journalist Alice Hart- Davis and is based on her years of experience. I can vouch for how well-regarded Alice is in the industry. She definitely knows what she's talking about. Each product utilises the power of superfruits for effective skincare benefits and everything in the range is free from nasties such as SLS, parabens and mineral oils. The quality of the products is fantastic, particularly when you consider that all of the prices are under £10. I love the packaging of Good Things skincare with its cute swirly design and bright fonts which hint at the superfruit ingredients. This is carried through on the packaging of Total Wipeout Face Wipes. My only complaint is that there's just a resealable sticker, whereas I tend to prefer a click closure to maintain freshness. 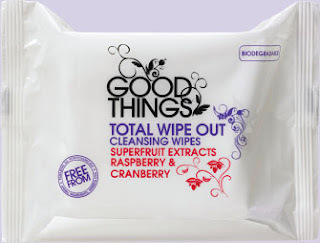 The wipes themselves are nice and damp so not only are they refreshing to use but it also feels as though they are lifting off makeup rather than simply moving it around your face. The wipes contain raspberry and cranberry extracts and the scent, which is exactly like berry yoghurt, reiterates this. I love how gentle these feel on the skin. Even the fabric of the wipes feels softer than others I've tried, with no roughness. What's more, they're biodegradable so unlike most wipes, won't add to landfill problems. I can't believe the price of these at just £3.49 for a pack of 25 wipes. They feel far more luxurious. These are by far the best face wipes I've come across. They're still wipes so I'm not going to go so far as to recommend them but if you are looking to buy some, these are the ones to go for. I'm not super keen on wipes either but I've repurchased these several times over the last year. They actually do take off my makeup when I can't be bothered to wash my face. Even the hubby likes them!